Hacklebarney State Park was established in 1924 when 32 acres of land were donated to the State by Adolph E. Borie. In 1967, the eastern portion (113 acres) of the original natural area of the park was donated by Anita Morle-Smith Knight. Through Green Acres acquisition, an additional 380 acres were acquired from 1964 to 1974. Additional acreage was obtained through donations and capital purchases bringing the current park size to 890 acres. Of the total acreage, 708 acres are located in Chester Township off State Park Road. 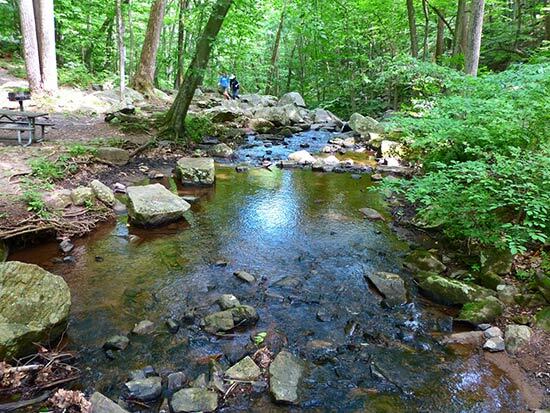 Hacklebarney State Park is primarily wooded and provides passive recreational opportunities, such as picnicking, fishing, and walking. The Black River, which bisects the park, is one of the premier trout fishing streams in New Jersey. All of the hiking trails are located in the northern section of the park by the main park entrance and park headquarters. The red-blazed Riverside Trail is the most challenging trail in the park as it has almost 0.5 mile of rocky uneven footing along the shore of the Black River and can be wet and slippery in high water. The yellow and orange trails are dirt paths that are easily travelled, and all other trails are wide gravel or paved paths that are accessible. The 3 Pools Trail is a short trail that connects the white-blazed Main Trail to the red-blazed Riverside Trail in the southern portion of the Park. For those wishing to avoid walking the rocky shore of the Black River, this is the link to the Main Trail. The trail starts 150 feet along the Main Trail from the kiosk and bathroom house at edge of the parking lot. It descends stone steps, passes through a picnic area, and descends very gradually on a paved path. At 0.2 mile it passes a junction with the purple-blazed Waterfall Trail across the river, and then reaches the scenic waterfall and short view trail over Trout Brook. The Trail then curves away from the brook and descends through open forest, passing a junction with the orange-blazed Wintershine Trail at 0.6 mile. After curving south, the trail reaches the Black River at 0.9 mile and travels along its rocky shore for the next 900 feet, reaching a junction with the blue-blazed Haki Trail at 1.0 mile. After crossing a bridge over the river, the trail passes a picnic area and bathroom house and again follows the rocky river bank for the next 0.2 mile – keep an eye out for fishermen trying their luck with the trout. At 1.2 mile the blue blazed 3 Pools Trail junction enters from the right. Now following a wide gravel path, the Trail descends and passes a large boulder in the River, which fell long ago from the walls of the gorge. After a 0.1 mile rocky section along the shore, the Trail crosses a bridge over Rhinehart Brook, then a smaller tributary, makes a sharp right turn at 1.6 miles and descends to re-cross Rhinehart Brook at 1.8 miles, reaching its terminus at the junction of the yellow-blazed Windy Ridge Trail and white-blazed Main Trail. This trail connects the Riverside and Main trails in the center of the trail system and also connects with the Wintershine Trail at the eastern end. It gradually ascends 150 feet on a wide gravel path. The trail starts 0.1 mile west of the parking area, along the park entrance road and is a woods road with gentle grading. It ascends for a short distance and passes a junction with the Pink Trail In 300 feet, then levels out and passes a second junction with the Pink Trail at 0.1 mile. At 0.3 mile an unmarked trail joins from the right and in a few yards leads to the pink-blazed Upland Trail loop. Now descending, the Trail ends in 0.4 mile at a picnic and playground area at the junction with the Yellow and White trails. Starting across the bridge from the junction with the red-blazed Riverside Trail 0.4 mile from the parking lot, the trail turns right uphill to connect with the white-blazed Main Trail in 0.1 mile (at the bridge crossing, to the left is a short trail to the top of the waterfall). The Windy Ridge Trail begins at the end of the green-blazed Playground Trail, 0.5 mile from the park entrance road. The trail follows the paved white-blazed Main Trail for 0.1 mile, then turns right onto a dirt path and ascends briefly, then descends gradually, passes a bench with a nonworking water fountain, and at 0.4 mile turns sharply left to descend more steeply. In 400 feet the trail reaches a T-junction and turns left along Rhinehart Brook, reaching its end at 0.5 mile. Starting 0.6 mile from the start of the red-blazed Riverside Trail near the parking lot, the Wintershine Trail descends gradually towards the Black River on a beautiful dirt path. It crosses unmarked trails at 0.25 mile and then becomes rocky, crossing the Trout Brook on a wooden bridge. It reaches a small picnic area just before the junction with the blue-blazed Haki Trail at 0.3 mile. The trail begins 0.5 miles from parking lot kiosk and is unblazed but signed; in 0.1 mile is a picnic area in a pleasant clearing.